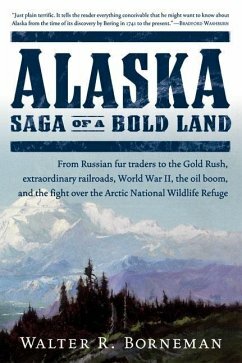 The history of Alaska is filled with stories of new land and new riches -- and ever present are new people with competing views over how the valuable resources should be used: Russians exploiting a fur empire; explorers checking rival advances; prospectors stampeding to the clarion call of "Gold! "; soldiers battling out a decisive chapter in world war; oil wildcatters looking for a different kind of mineral wealth; and always at the core of these disputes is the question of how the land is to be used and by whom. While some want Alaska to remain static, others are in the vanguard of change. Alaska: Saga of a Bold Land shows that there are no easy answers on either side and that Alaska will always be crossing the next frontier. Dieser Download kann aus rechtlichen Gründen nur mit Rechnungsadresse in A, B, BG, CY, CZ, D, DK, EW, E, FIN, F, GR, HR, H, I, LT, L, LR, M, NL, PL, P, R, S, SLO, SK ausgeliefert werden.